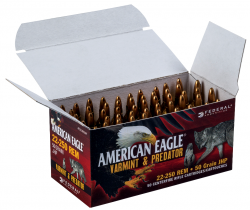 ANOKA, Minnesota – Federal Ammunition is pleased to announce new American Eagle Varmint & Predator loads, offered in 40- or 50-count bulk packs perfect for high-volume shooting. Shipments of this new product are now being delivered to dealers. Combine accuracy, consistency, reliable performance on target and an affordable price tag, and the result is the perfect round for the avid varmint hunter. New American Eagle Varmint & Predator loads feature reloadable brass and Federal primers with a jacketed hollow point or Tipped Varmint bullet, depending on caliber. Both designs expand explosively on impact for maximum lethality.